In my personal experience, it seems as though there are two types of hobbyists that are interested in multirotor machines – the sport flyers who like the small and micro quads and fly for fun, and the pilots who want to attach a camera on their machine to get aerial photos and video. When the Blade 350 QX was recently released to the market, they actually combined both desires into one machine along with the addition of some pretty awesome technological features. The 350 QX comes in both bind-n-fly (BNF) and ready-to-fly (RTF) versions. Both versions come with the fully-assembled 350 QX, battery and charger. 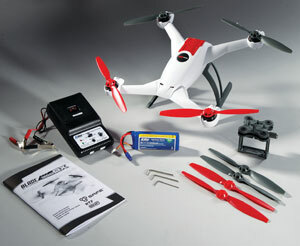 The RTF version also comes with a Spektrum DX5e transmitter and four “AA” batteries. The 350 QX is a very attractive quadcopter with a futuristic look to it. When you take it out of the box, all you need to do is charge the battery and fly. The 350 QX gets its lift from four powerful 1100Kv brushless motors and a 3S 2200mAh LiPo battery. This is plenty of power to lift a GoPro camera with its protective case and still have relatively long (8-12 minute) flight times. Common occurrences that you often find on multirotor machines equipped with a GoPro is a shake and blur known as “Jell-O Effect.” One way to avoid (or minimize) this is to fabricate a dampening system. Blade took this problem into consideration and included four dampeners, which work very well. Up until this point, the 350 QX looks just like any other multirotor machine; a body, four arms and four motors/props. However, it is what you cannot see that makes the Blade 350 QX such an amazing machine. The Blade 350 QX has some of the most advanced electronics that I have seen in a flying machine at this price point. The heart of what makes it so great is the Blade SAFE (Sensor Assisted Flight Envelope) technology. SAFE is a revolutionary electronic flight envelope protection system that offers smoother flight capability which makes flying in windy conditions much easier. It offers multiple flight modes so you can fly with the level of protection and assistance that best matches your flight conditions. There are seven main features that I will outline that make the Blade 350 QX one amazing machine. Smart Mode While in Smart Mode, SAFE technology prevents the 350 QX from pitching or rolling past a certain angle, thus making it very difficult for the pilot to over-control the aircraft, even with full stick deflection applied. The 350 QX will also return to a stable and level hover as soon as you return the sticks to the center position. GPS/Attitude Hold, SAFE Circle and Stick Relativity are all available in this mode. Stability Mode In Stability Mode, the 350 QX will have a very limited flight envelope with self-leveling capability for consistent level flight and optional GPS Hold. 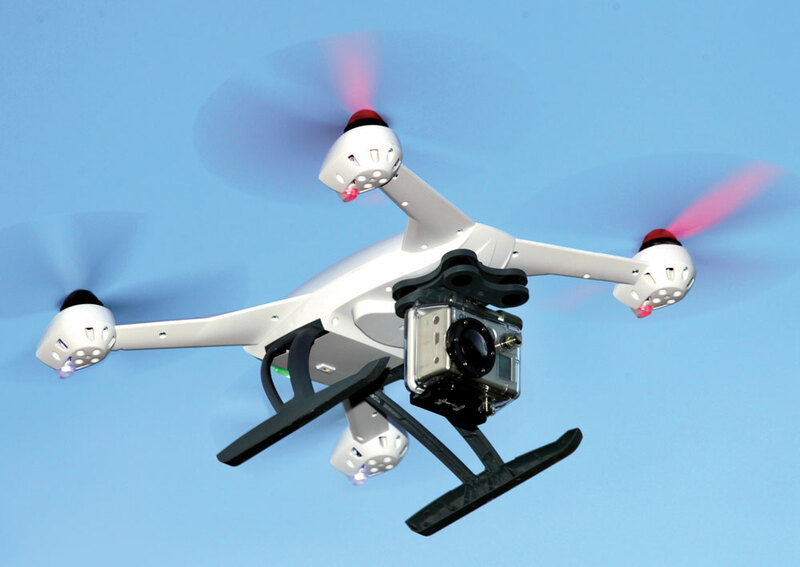 This mode is the best choice for capturing video as the QX will fly smoothly, and when GPS Hold is enabled it will remain in a fixed position in space while the video records. Agility Mode The Agility Mode is designed for more experienced pilots, allowing aerobatic maneuvers to be performed. The AS3X flight characteristics, coupled with an unlimited flight envelope, will allow the 350 QX to perform maneuvers such as flips and rolls. You will also experience an increase in speed and response time for all control inputs. SAFE Circle While in Smart Mode, the 350 QX will offer the pilot protection in the form of a 30-foot-diameter invisible barrier called SAFE Circle. SAFE Circle prevents the 350 QX from entering this airspace, thus preventing pilots from flying too close to themselves. Stick Relativity This is a very unique feature which is incredibly helpful, especially with novice pilots. When activated, as you move the cyclic stick to the left or right, the 350 QX will move left or right relative to the pilot regardless of which way the machine is pointing. GPS and Altimeter Technology The integrated GPS and Altimeter sensors are designed to keep the 350 QX in a stable hover position regardless of wind conditions. This feature is always on in Smart Mode and it allows you to concentrate on panning the 350 QX or slightly moving it for seamless video capture. Return Home With the flip of a switch on the transmitter and no stick input from the pilot, the 350 QX will automatically return to the position where its motors started for that particular flight. As we were anxiously awaiting the arrival of the Blade 350 QX, I made a list of tests that I wanted to put the quad through once I got the controller in my hands. I was very intrigued with all the technology features and wanted to see if they lived up to the hype. Additionally, I wanted to attach a GoPro Hero 2 camera and see how well this platform worked to capture aerial video and photos. Before putting a couple hundred dollar camera on the quad, I made several flights around our field testing each of the three modes (Smart, Stability and Agility). My first flight was using Smart Mode and I was especially interested in the SAFE Circle. Prior to flight, I measured a 30 foot circle and using powdered lime, I drew the circle. I stood in the center of the circle and flew the 350 QX about 75 to 100 feet away from myself. Every attempt to fly within the realm of the circle were thwarted by the system. I tried from various speeds and altitudes and I could not get it to fly inside that circle. Impressive! The Stick Relativity function was another feature that intrigued me. One common problem with multirotor machines is maintaining orientation. Since they are symmetrical machines, you can quickly lose track of what is the front or back if you are not paying attention. When this feature is enabled, the left and right stick movement will move the 350 QX to the left or right in relation to the pilot regardless of which direction it is facing. With SAFE Circle activated and using Stick Relativity, a left or right stick movement will continually move the quad in a circle around the pilot. This is a very cool feature that adds another level of enjoyment to flying the 350 QX. The GPS Hold did just that. Once activated, the 350 QX stayed within a designated area in space and would remain there regardless of the wind. In fact, we even put the controller down and the 350 QX remained right where we activated GPS Hold. The Return Home feature was also very cool. When you spool up the 350 QX for your initial flight takeoff, the system remembers its location. At any time in flight you can simply hit the Return Home switch and it will fly right back to that exact starting point with no control input from the pilot. This is a great feature for new pilots as it will save the machine from damage due to hard or uncontrolled landings. The last thing I wanted to do was see how responsive the 350 QX is in Agility Mode. I am not a huge fan of flying aerobatics with a multirotor in the first place. That is not what my helicopters are for, but I did want to see how well this machine could flip or perform a roll. I was surprised at how snappy it was and I actually found myself really enjoying flying these maneuvers. You do need to make sure that you have some altitude because the blades are all fixed pitch and when you go inverted, they are pushing air in the direction that will the 350 QX directly towards the ground. Even in a fast flip or roll, you might lose a couple of feet of altitude. The increased forward speed and responsiveness of the controls made this machine feel like a whole new animal. The Blade 350 QX is one very unique and feature-rich quadcopter. If you are looking for a solid all-in-one solution for capturing photos and video from the air using your GoPro camera, then you will be very happy with the results using the 350 QX. The three different flight modes allow any user, novice to expert, a chance to really have some fun with this machine. The SAFE Circle is one of my favorite features to help keep the pilot safe. The best part of the 350 QX is that you do not need to add anything additional to be able to shoot great aerial footage right away. 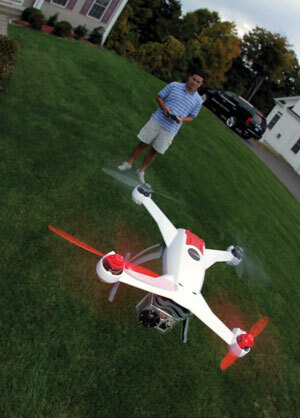 The Blade 350 QX was reviewed in the Spring 2014 issue of MultiRotor Pilot. We’re reproducing this article here to introduce our online readers to the 350 QX series of multirotors. To get the latest multirotor news, please keep following MultirotorPilotmag.com and pick up the latest issue of the magazine at your local newsstand, hobby shop or online at shop4rc.com .